These basic white rolls have a good texture and tang from the addition of buttermilk. Sprinkle yeast over 1/4 cup warmed buttermilk and set aside for 10-15 minutes until yeast softens and begins to bubble. Mix melted butter with 1 cup room temperature buttermilk. Stir flour, sugar, salt, and baking soda together in a mixing bowl. Pour both liquid ingredient mixtures into the flour mixture. Using the dough hook on a stand mixer, work flour into liquids to form a soft dough. Transfer dough to a lightly floured work surface and begin to knead. It might be a little sticky at first, but try not to add any more flour than you have to! Knead for about 8 minutes or until smooth, resilient, and no longer sticky. Place dough back into the mixing bowl (coat with a little oil if desired) and cover. Allow to rise until doubled in size, about 1 1/2-2 hours. Cover pan with plastic wrap. Let rise for 45 minute or so, until dough has almost doubled in size and is puffy in appearance. Try not to let the dough touch the plastic wrap--it will stick and then fall when you uncover for baking. Preheat the oven to 375 degrees. Remove plastic wrap from risen rolls. Bake for 25-30 minutes or until golden on top. Let cool for 5 minutes in pan, then invert out of pan and allow to finish cooling on a cooling rack or plate. Preheat oven to 350 degrees. Grease a 13 by 9-inch baking dish. In a mixing bowl, whisk together flour, baking powder and salt, set aside. In the bowl of an electric stand mixer fitted with the paddle attachment, whip together butter and sugar until pale and fluffy. Mix in eggs one at a time, then blend in vanilla and almond extracts. With mixer set on low speed, slowly add in dry ingredients and mix until combined. Set aside 1 cup of batter and spread remaining evenly into prepared baking dish. Top with cherry pie filling spreading into an even layer. Crumble the remaining batter evenly over top. Bake in preheated oven about 40-50 minutes or until crust is fully done. Remove from oven and allow to cool completely on a wire rack before cutting into squares. This is easily one of my most requested recipes. It is a very popular staff lunch choice, and I always look forward to eating it as well as making it. Colorful, flavorful, unusual, fun to eat, good leftovers, easy to freeze and reheat--what's not to love?!! 10 large lettuce leaves Than says green leaf, I say iceberg. You pick. In a large skillet, heat 1 Tbsp. oil on high. Add ground chicken, diced onion, and grated carrot. Cook until chicken is nearly done, stirring often to break up the meat. Meanwhile, in a microwave safe bowl or glass mixing cup, combine sesame oil, soy sauce, peanut butter, honey, rice vinegar, and chili garlic sauce. Microwave for 30 seconds to soften the honey and peanut butter, then stir until well mixed. Add minced garlic and ginger to the chicken mixture and cook a minute or two more or until fragrant. Season with salt and pepper. Pour peanut butter mixture into the skillet and stir well to coat the chicken mixture. Add red pepper, green onion, and water chestnuts to the skillet and cook for 2-4 more minutes or until everything is heated through. Rinse the lettuce leaves, pat dry, and put on a plate or in a bowl. Put chopped peanuts in a separate bowl, and chicken mixture in a third serving bowl. I’ve been making this colorful salad since we were first married. I serve it at staff lunch often, since it looks so pretty and holds up well even if made ahead. In large bowl, combine all veggies. (If making more than 3 hours ahead of serving time, you might want to keep the spinach out until you are ready to toss and serve. I’ve served this at several occasions over the past few years, and I always end up needing to share the recipe! I found the original recipe on Pinterest (of course), and here’s that original link. I love to make it in late summer and early fall before my basil plants freeze. I am also including the salad ingredients, which make for a colorful backdrop, but the dressing is the main thing. Just make it. You’ll see what I mean. This delightful green salad dressing has an unbeatable flavor, and is a great thing to make when you're pruning the basil in your garden. I'm including the salad recipe too, but it is good on a wide variety of veggie options. Add all dressing ingredients to a blender and blend until smooth. There, that was easy!! 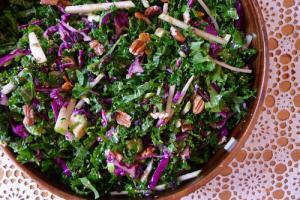 Shred the kale and red cabbage. Add to your bowl. Quarter the cucumbers and slice them into small quarter slices. Julienne the green apple. Cube the avocado if using and scoop it into the salad. Sprinkle the lemon juice over the apple and avocado so they don’t turn brown. Toast the sesame seeds in a 400 degree oven for 2-4 minutes, until toasty but not burnt. Whisk together the orange juice, sesame oil, grated ginger, rice vinegar, soy sauce, and honey until well incorporated. Add the toasted sesame seeds. Add the pecans and currants to the bowl, then pour the dressing over it and toss well in a large bowl. Dress the whole salad even if you’re saving some for later because it ages well.